SAE International honored Daniel DiMase, Director of Compliance and Quality at Honeywell International Inc. with the Arch T. Colwell Cooperative Engineering Medal. 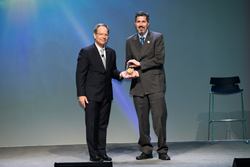 DiMase was presented with the medal during the annual Awards Ceremony at the SAE International WCX World Congress Experience, recently held in Detroit. DiMase is a part of the Quality Systems & Regulatory Compliance team with Honeywell’s Aerospace business. Established in 1976, the award recognizes a unique and outstanding contribution over a period of time to the work of the technical committees under the SAE International Technical Standards Board in developing standards, specifications, technical reports, and data through cooperative research. It is intended to stimulate technical committee members to greater accomplishments and the realization of satisfaction that comes from sharing their expertise. DiMase is a part of the Quality Systems & Regulatory Compliance team with Honeywell’s Aerospace business. His primary area of responsibility is to mitigate the severe and growing threat that counterfeit parts pose to Honeywell Aerospace’s highly diversified business operations. He guides the implementation of internal policies, procedures, and tools to mitigate counterfeit and cyber physical systems security risks related to product assurance, safety and security, and manages customer and regulatory concerns in those areas. DiMase has co-authored numerous peer-reviewed technical publications and is a long-term collaborator with industry, academia, and government teams charted with advancing the state of the art and scientific knowledge in related topics. His contributions to SAE International are considerable as a member of the SAE International’s G-19 Counterfeit Electronic Parts Document Development group, SAE Chairman Emeritus of the Test Laboratory Standards Development committee, co-chairman of the Distributor Process Rating committee, along with other committees addressing counterfeit avoidance and detection and cyber physical systems security. DiMase offers one piece of advice to those starting out in mobility engineering and that is to “engage in industry technical committees addressing topics in your work area and to learn how systems work. Technological advancements in systems, processes, and tools in mobility engineering improve the lives of ourselves and the people we care about. Collaboration with industry, government, and academia to advance state of the art and scientific knowledge can be very rewarding not only to oneself, but to all consumers of the markets we serve”.